In this article we examine current market prices for every type commercial real estate in Louisiana. INDUSTRIAL: The Industrial sector has 926 properties totaling 21.1 million square feet and an average asking sale price of $34 per square foot and average lease rate of $4.77 per square foot. The average property is on the market an astounding 460 days. OFFICE: The Office sector has a population of 2,493 properties with and average sale price of $80 per square foot and average lease price of $15 per square foot and on the market an average of 293 days. RETAIL: Comprises 1,476 properties averaging $94 PSF in sale price and $12.76 PSF for lease with 266 days on the market. SHOPPING CENTER: Classified by most as part of the Retail sector, but separated out here as 700 properties averaging a sale price of $88 PSF and lease price of $15.87 PSF with 596 days on the market. LAND: The largest sector with 1.7 billion square feet and 2,570 properties averaging a sale price of $1.43 PSF and lease price of $1.65 PSF. 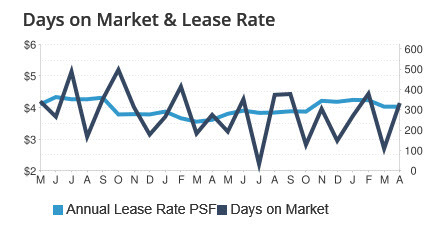 Seems like its a no-brainer to buy the land at $1.43 PSF and lease it out at $1.65 PSF but it takes so long to transact a deal that the Average Days On The Market does not even show in records. It can take decades to lease or sell land. MULTI-FAMILY: 102 properties averaging a sale price of $38 PSF , although most are sold based on Net Operating Income or Price Per Unit. Multi-Family is the category in the highest demand, as witnessed by the lowest days on the market at 144. Since the recession in 2008 and the housing market collapse, it has required a higher deposit to purchase a home, causing an increase in renting, resulting in a higher demand for apartments, which leads to higher occupancy rates, which results in large institutions changing their asset allocation away from shopping center investment to apartments, which causes a shift in demand leading to higher prices for apartments and lower Capitalization Rates. Whoo! Yes, it is a Domino Effect, and the trend will continue. Let’s carve out one of the sectors comprising all Louisiana commercial real estate and break it down. The Industrial market is comprised of 926 properties with 570 for lease and 356 for sale. There is 10 million square feet for lease and about the same for sale. 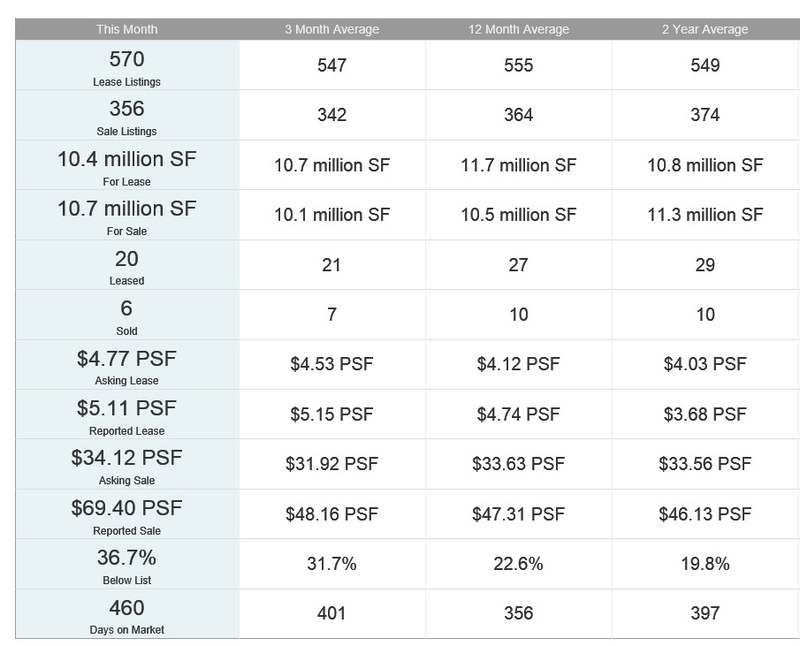 On average the last two years, 29 properties have been leased at an average of $3.68 per square foot and 10 properties have sold at an average of $46 per square foot. This is an average of all the industrial properties in Louisiana, and certain areas may be stronger or weaker. Just like the analyst on Bloomberg and CNN who prognosticate with 100% accuracy that the markets will be volatile and fluctuate, providing no more insight than a zoo animal throwing a dart, the chart below shows that over the last 2 years the price of leasing Industrial space on average in Louisiana has gone up and down but not gone anywhere at about $4 per square foot. The average days on the market ended up where they began at around 300. 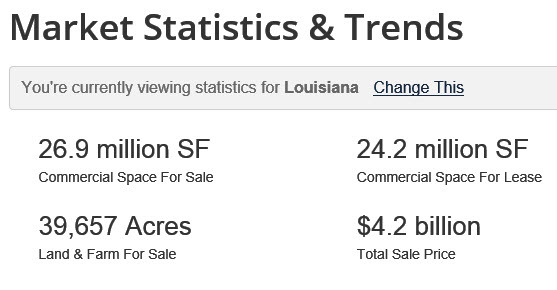 Tune in next week for a detailed look at prices of other sectors of commercial real estate in Louisiana.